Multi-purpose, concentrated marine cleaning solution safe enough for dishes and hands, strong enough to clean dirty sails, decks, heads, and hulls. Leaves a sparkling, film-free surface. Use in warm or cold, fresh or salt water. 100% biodegradable. Nobody likes a mess aboard their boat. However, many common household or even marine-specific cleaners contain chlorine or other harsh chemicals that can damage, dry out, or strip protective finishes from surfaces. 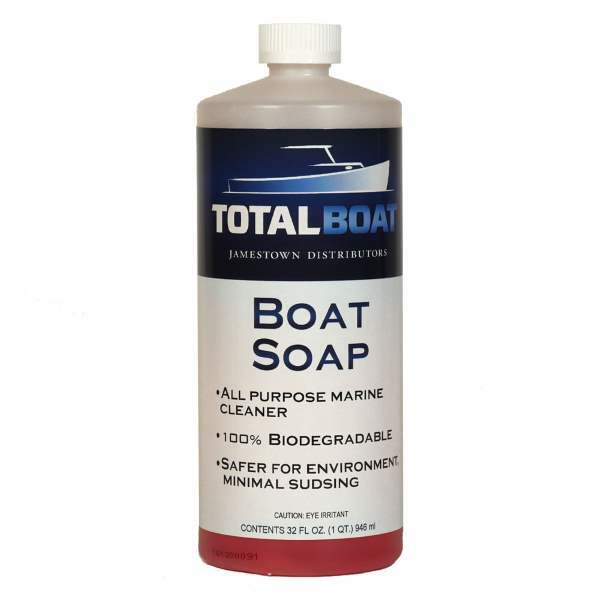 TotalBoat Boat Soap is a gentle, but powerful cleaner useful anywhere on and around your boat. Its environmentally safe formula is strong enough for bird droppings and scum, but mild enough to effectively clean delicate Dacron and nylon sails, dishes, and even your hands.